Committee Room 4 is the only one of the four committee rooms not to have mobile phone coverage. A GOVERNMENT TD has blamed its defeat in an Oireachtas committee vote last night on a strange turn of events where two Fine Gael members left the room to try and round up their absent colleagues – only to be locked out themselves. Fine Gael’s Liam Twomey, who is the vice-chair of the finance committee on which the government holds a 16-11 majority, said he and another TD Kieran O’Donnell had left the room to try and find their party colleagues who were attending a meeting elsewhere. But the other party TDs – who were in a different wing of Leinster House at the time, attending Fine Gael’s weekly meeting of the parliamentary party – could not be convened in time for the vote, on a motion tabled by one of their own TDs, Peter Mathews. And in their vain attempts to round up enough colleagues to defeat the vote, Twomey and O’Donnell were themselves absent for too long – leaving committee chairman Alex White, of Labour, with no option but to have the doors locked for the vote to take place. Twomey told RTÉ’s Morning Ireland that committee room 4, in which yesterday’s meeting had been taking place, was the only one of the four committee rooms not to have mobile phone access. This meant the TDs had to leave the room in person in order to find their party colleagues. 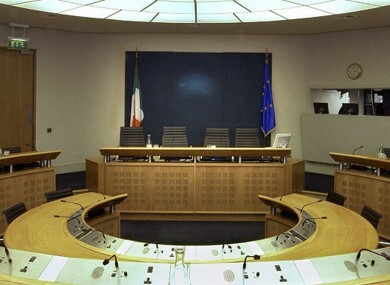 Leinster House’s committee rooms are in a basement level of the LH 2000 wing, while the FG meeting was taking place on the fifth floor of the main building. Had Twomey and O’Donnell instead waited in the committee room, instead of trying to find their colleagues, the vote would have been tied at 11-11 – and would have fallen, as the motion would have needed a clear majority in order to be passed. The committee had been debating whether to invite Central Bank governor Patrick Honohan to a committee meeting, with Twomey reporting that while the governor had no problem in attending a meeting, he was unavailable to attend within March. The government members had been happy to accept this, Twomey said, but Peter Mathews wanted to send Honohan a “stronger letter” encouraging him to visit next week, before the first €3.1 billion repayment of the promissory note is due. Ultimately Mathews voted against his own proposal, reportedly “under protest”, after being advised that a Yes vote would mean Mathews had broken the whip and would be removed from the Fine Gael parliamentary party. Mathews was uncontactable this morning. This morning a Central Bank spokesman declined to comment on whether Honohan would accept the invitation to appear next week, saying only that he would “reply directly to any correspondence he may receive”. Email “Government lost committee vote 'because TDs were locked out of the room'”. Feedback on “Government lost committee vote 'because TDs were locked out of the room'”.